Thai human rights activist and worker Somyot Prueksakasemsuk has faced a provincial court in Phetchabun, Thailand, for the hearing of the second prosecution witness, a former employee of his magazine, Voice of Taksin, in his trial on charges of lese majeste. Benja Homwan, currently a company employee, testified in court that she had been a member of the administrative staff for the magazine since the executive editor was Prasaeng Mongkhonsiri who was later replaced by Somyot. She was responsible for membership subscriptions and the distribution of the magazine to almost 1,000 members. She also had to check emails, and save and print articles which were sent to Somyot for him to read, but she did not know whether Somyot ever edited those articles. She saw that a sender named ‘Jitr Pollachan’ sent articles, which were the grounds for this prosecution against Somyot, and heard her colleagues saying that it was a pen name of Jakraphob Penkair. Jakraphob, a politician allied with Thaksin Shinawatra, was charged with lèse majesté for his speech on Thailand’s patronage system at the Foreign Correspondents Club of Thailand in August 2007, and he fled the country after the red shirt demonstrations were dispersed by the Abhisit Vejjajiva government in April 2009. ‘Jitr Pollachan’ is a mix of the names of two legendary Thai Marxist revolutionaries: Jitr Bhumisak and Assanee Pollachan. The prosecution witness, in answer to defence questions, said that she did not know whether Jakraphob was really ‘Jitr Pollachan’, and she had never seen him visiting the office. She saw several articles by Jitr Pollachan published in the magazine, but did not know whether they had been published after Prasaeng was the executive editor. She said that Somyot had contributed to the magazine using his real name. 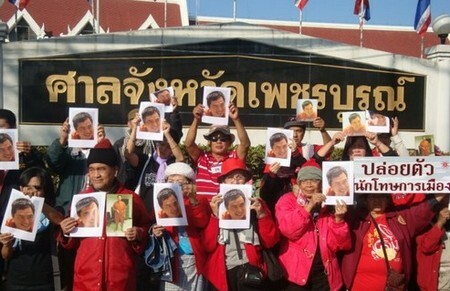 The first hearing in Somyot’s case was held in Sa Kaew province in eastern Thailand on 21 Nov. He was brought to Phetchabun on 28 Nov. He will be transferred further north to Nakhon Sawan and then down to Songkhla in the south for the next prosecution witness hearings on 16 Jan and 13 Feb 2012, respectively. Earlier, eight international human rights NGOs have launched an appeal to Thailand’s Yingluck Shinawatra government calling for charges against Somyot Pruksakasemsuk to be dropped and for the nation’s harsh lese majeste laws to be repealed. The Asian Forum on Human Rights and Development, Clean Clothes Campaign, Front Line Defenders, International Federation for Human Rights, Lawyers’ Rights Watch – Canada, Protection International, Southeast Asia Press Alliance, and World Organisation against Torture launched the appeal last month. Somyot is a former fulltime worker for the Thailand YCW.